DeNooyer Chevrolet in Albany, New York is in love with the new Camaro. It also loves the history of the model line, especially when dealers and customizers got their hands on the cars. We've already seen DeNooyer team up with Redline Motorsports to bring us their COPO HTR Camaro. Now the two have teamed up with Joel Rosen to resurrect the Baldwin-Motion Camaros. In 1966, Joel Rosen started up his Motion Performance shop and partnered with Baldwin autos to produce a handful of boosted Chevy products. The Baldwin-Motion team offered Novas, Biscaynes, Chevelles, Corvettes and, of course, Camaros. The original Baldwin-Motion cars were available in SS (425 horsepower) or Phase III versions (500 hp and up). Joel Rosen stood so firmly behind his Motion sports cars that he provided a written guarantee stating they were capable of running the quarter-mile in 11.50 seconds and hitting a trap speed of 120 miles per hour. Not one Baldwin-Motion owner ever returned a car. Now Joel Rosen is partnering up with DeNooyer Chevrolet and Redline Motorsports to usher in a new era of Motion Camaros. Five special edition cars are available with a choice of either an aluminum LS7 427 or LSX 454. The Motion SS-427 and SS-454 make 525 and 550 horsepower, respectively. Both versions wear custom Motion touches like graphics, seat inserts, headrests and special badges. For the Phase III cars, power is upped to 600 hp for the Phase III-427 while the Phase III-454 pumps out 625 hp. Phase III cars get further upgraded intake manifolds, a special engine management system, custom Motion aerodynamic body pieces and more custom touches to the interior. The fifth car in the lineup is the Motion Phase III 427-SC, and that SC stands for supercharged. Output is pushed to a pavement pummeling 800 hp and the 427-SC receives forged internals as well as upgraded Brembo brakes and suspension components. 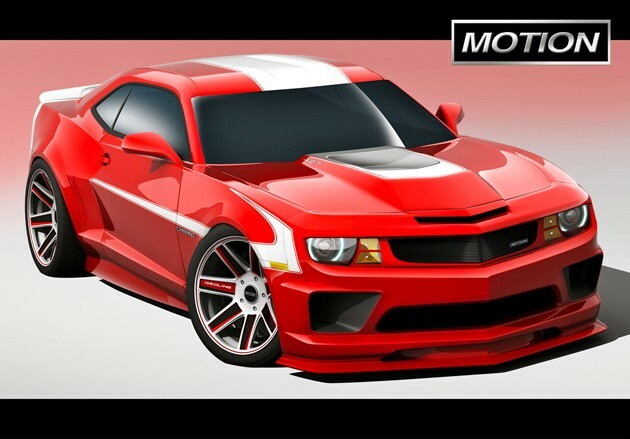 The 2011 Motion Camaro cars will all be built to order, wear unique VINs and show off Joel Rosen's signature. Hop the jump to read the full press-release and be sure to get a look at the Motion Camaro in the gallery below. 2011 Chevrolet Camaro sets stage for Baldwin-Motion return originally appeared on Autoblog on Fri, 21 Jan 2011 13:30:00 EST. Please see our terms for use of feeds.